The Medal of Saint Benedict has long been used as a means of fostering and expressing religious devotion. The medal is intended as a means of reminding us of God and of stirring up in us a ready willingness and desire to serve God and our neighbor. With this understanding we reject any use of it as if it were a mere charm or had some magic power to bring good luck or better health. Such is not the Christian attitude. That is not to say that devotion to God with attention to the medal is not a source of great help and power. Whoever wears this Medal with devotion, trusting in the life-giving power, may expect the powerful protection of the great patriarch of Western Monasticism in spiritual and temporal need. 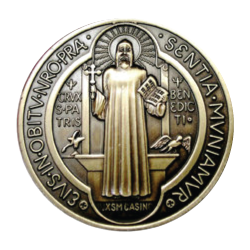 On the face of the medal is the image of St. Benedict. In his right hand he holds the cross, the Christian symbol of salvation. In St. Benedict’s left hand is his rule for monasteries that could well be summed up in the words of the prologue exhorting us to “set out on this [God’s] way, with the Gospel for our guide.” On a pedestal to the right of St. Benedict is the poisoned cup, shattered when he made the sign of the cross over it. On a pedestal to the left is a raven about to carry away the loaf of poisoned bread that a jealous enemy sent to St. Benedict. Benedictines have always regarded St. Benedict as a special patron of a happy death. He himself died in the chapel at Montecassino while standing with his arms raised up to heaven, supported by the brothers of the monastery, shortly after he had received Holy Communion. There is no special way prescribed for carrying or wearing the Medal of St. Benedict. It can be worn on a chain around the neck, attached to one’s rosary, kept in one’s pocket or purse, or placed in one’s car or home. The medal is often put into the foundations of houses and buildings, on the walls of barns and sheds, or in one’s place of business. The Medal of St. Benedict can serve as a constant reminder of the need for us to take up our cross daily and follow “the true King, Christ the Lord,” and thus learn to “share in the sufferings of Christ that we may deserve also to share in his kingdom,” as St. Benedict urges us in the prologue of his rule. By a rescript of the Sacred Congregation of Religious (4 May 1965), lay oblates of St. Benedict are permitted to wear the Medal of St. Benedict instead of the small, black cloth scapular formerly worn. This medal is presented to oblate candidates during their candidacy ceremony. By a decree of the Sacred Congregation of Rites (6 March 1959), the Blessing of St. Maurus over the sick is permitted to be given with a Medal of St. Benedict instead of with a relic of the True Cross, since the latter is difficult to obtain. From the writings of St. Gregory the Great (540-604), we know that St. Benedict had a deep faith in the cross. In his frequent combats with the evil spirit he made use of the sign of the cross and worked miracles. St. Gregory the Great, a promoter of Benedictine life, in his Dialogues (II:4) represents St. Benedict as dispelling his own temptations by the sign of the cross. It is also fitting that on the Medal of St. Benedict we should find represented the poisoned cup broken by the sign of the cross that the saint made over it when the degenerate monks of Vico Varo endeavored to kill him by mixing poison with his drink. St. Gregory says that when St. Benedict made the sign of the cross over the cup, it was shattered as if struck by a stone. This faith in, and special devotion to, the cross was passed on to succeeding generations of Benedictines, notably Ss. Maurus and Placid, his first and most renowned disciples, who worked numerous miracles through the power of the Holy Cross and in the name of their holy founder. Devotion to the cross of Christ also gave rise to the striking of medals that bore the image of St. Benedict holding a cross aloft in his right hand and his rule for monasteries in his left hand. Thus, the cross has always been closely associated with the Medal of St. Benedict. Other additions were made over time, such as the Latin petition on the margin of the medal, asking that by St. Benedict’s presence we may be strengthened in the hour of death. We do not know just when the first medal of St. Benedict was struck. At some point in history a series of capital letters was placed around the large figure of the cross on the reverse side of the medal. For a long time the meaning of these letters was unknown, but in 1647 a manuscript dating back to 1415 was found at the Abbey of Metten in Bavaria giving an explanation of the letters. The medal just described (and pictured above) is the jubilee medal, which was struck first In 1880, to commemorate the fourteenth centenary of St. Benedict’s birth. The Archabbey of Monte Cassino has the exclusive right to strike this medal. The ordinary medal of St. Benedict usually differs from the preceding in the omission of the words “Ejus in obitu etc.”, and in a few minor details. Any priest may receive the faculties to bless these medals. Medals of St. Benedict are sacramentals that may be blessed legitimately by any priest-not necessarily a Benedictine (Instr., 26 Sept. 1964; Can. 1168). The following English form may be used. In the name of God the Father + almighty, who made heaven and earth, the seas and all that is in them, I exorcise these medals against the power and attacks of the evil one. May all who use these medals devoutly be blessed with health of soul and body. In the name of the Father W almighty, of the Son W Jesus Christ our Lord, and of the Holy W Spirit the Paraclete, and in the love of the same Lord Jesus Christ who will come on the last day to judge the living and the dead, and the world by fire. Let us pray. Almighty God, the boundless source of all good things, we humbly ask that, through the intercession of St. Benedict, you pour out your blessings + upon these medals. May those who use them devoutly and who earnestly strive to perform good works be blessed by you with health of soul and body, the grace of a holy life, and remission of the temporal punishment due to sin. GUERANGER, Essai sur l’origine, la signification et les privileges de la medaille ou croix de S. Benoit (Poitiers, 1862; 11th ed., Paris, 1890); CORBIERRE, Numismatique Benedictine (Rome, 1901); KNIEL, Die St. Benediktsmedaille, ihre Geschichte, Bedeutung, Ablasse u. wunderbare Wirkungen (Ravensburg, 1905). MICHAEL OTT, Transcribed by Herman F. Holbrook, Sancti Patris Benedicti in obitu nostro praesentia muniamur.